The 1920s and 30s may be remembered for many things, but it probably wouldn’t be for having any great public affection for the grand houses which had so dominated the landscape agriculturally, economically and politically. Faced with the reality of the long slump in revenue from the land and wider economic difficulties, country house owners found themselves between the rock of their own financial situations and the hard place of a nation broadly unsympathetic to their difficulties. Many an owner may have offered up a prayer for some form of divine intervention to alleviate their situation – and the miracle which appeared which saved their house, though not their lifestyles, was religious orders purchasing these grand piles for their ministries. With the recent launch on the market of the impressive Hawkstone Hall in Shropshire, the cycle turns again, as it looks like the wealthy will rescue the religious. A nobleman’s residence in the medieval period was often a castle but this dramatically changed following Henry VIII’s Dissolution of the Monasteries between 1536-41. The aftermath created one of the greatest transfers of land (in the 1530s, they were estimated to hold approx 16% of England) and property as the riches of these institutions were either given to favoured courtiers or sold, creating instant country estates. Yet, at that time, they were seen more as industrial units; great agricultural establishments which brought in great wealth, with the beautiful priory churches often stripped for their materials. However, for some owners, the buildings were a fine opportunity to create a house – and what better way of creating the impression of an ancient family than with an ancient seat, especially if it came with prized feudal rights. Of course, there is a long history of country houses being used for religious purposes as many recusant families continued practising their Catholic faith at great risk to themselves both financially and physically, such as at Mapledurham in Oxfordshire or Hintlesham Hall in Essex. This secrecy led to the creation of many ingenious methods of hiding not only the chapels (either in attics such as at Ufton Court, Berkshire, or by being disguised as bedrooms) and items of their faith but also the priests themselves, usually in ‘priest holes‘ which could be concealed behind panelling and walls (e.g. at Harvington Hall – still owned by the Archdiocese of Birmingham), in chimneys, under fireplaces and so on. There don’t appear to be any clear records of which houses have been used as convents/monasteries so it remains anecdotal (there’s probably a good PhD topic in there somewhere) but it’s possible that hundreds of houses have served in this use, especially if convent schools and retreats (e.g Capernwray Hall and Kinmel Hall) are included. For many of these, it’s likely that this alternative use saved them from joining the ranks of those demolished. For the past 85 years, grade-I listed Hawkstone Hall has been a seminary and also a retreat for Catholic clergy. The house was originally built in 1720 for Richard Hill (b.1655 – d.1727), a traveller and diplomat who had made a fortune through what was described as ‘lucrative arithmetick‘, and consisted of just the main block. The design of this section is quite unique, certainly to the area, and pre-dates designs later shown in Campbell’s ‘Vitruvius Britannicus‘ published in 1715-25. 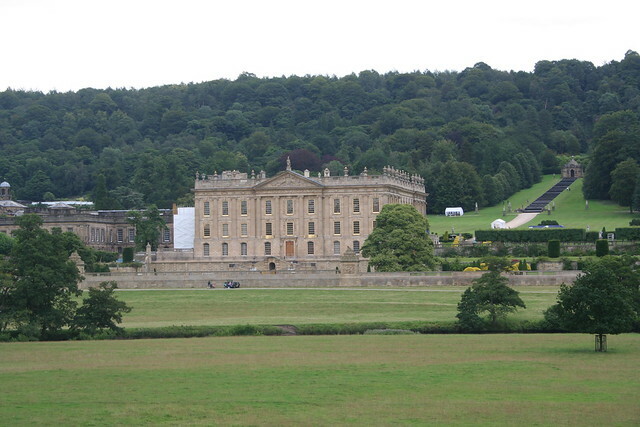 Although it shares certain elements with other houses (Buckingham House, Chatsworth – east front), neither the listing description nor Colvin have details on the original architect so it is open to conjecture as to who designed it and where they got their inspiration (if anyone does know/have any suggestions, please do add a comment below or contact me). Hawkstone was then inherited by his son Sir Rowland Hill, 1st Baronet (1705–1783), who added the wings as part of an enlargement in 1750, but who also, more importantly, started the landscaping for which the estate was to become famous. Taking advantage of a natural rocky outcrop, Hill created a series of walkways on the cliffs, view points and follies which attracted many visitors. This grew to such an extent that Sir Richard Hill, 2nd Baronet (b.1733 – d.1808) wrote the first guidebook for the park and also built the ‘Hawkstone Inn’ to cater for the visitors. Such was its reputation that Dr Samuel Johnson came to see and was duly impressed, remarking on “…the awfulness of its shades, the horror of its precipices….“. Johnson also commented that he thought there ought to be more water and so Sir Richard commissioned landscape designer William Emes, who created the Hawk River which still flows to the north-west of the house. Hawkstone Park had become one of the most popular attractions in the country by the time of his death in 1808 and remained so under the care of his brother, Sir John Hill, 3rd Baronet (b.1740 – d.1824), who inherited. Sadly, it was to be the next generation who sowed the seeds of the families financial troubles. The house and park were inherited by Sir Rowland Hill, 4th Baronet Hill of Hawkstone, 2nd Viscount Hill (1800–1875) who, through extravagance or mismanagement, lost much of the family fortune. Inside, he commissioned, between 1832-4, various alterations including a new drawing room from Sir Matthew Wyatt, whilst in the grounds he carved a hugely expensive new drive through a cliff and built The Citadel, a strange castle-like dower house. He even toyed with the idea of relocating the entire house to the other side of the river. Such spending was always likely to lead to difficulties and the 3rd Viscount, Rowland Clegg-Hill, (b.1833 – d.1895), never managed to re-establish the fortune and was bankrupt by the time of his death. This forced a sale of the contents and then the splitting up of the estate in 1906. The park, with the many follies, tunnels and caves, was sold off and is now run as part of the Hawkstone Park hotel. The Hall was bought by George Whitely, later Baron Marchamley of Hawkstone, a wealthy mill and brewery owner and MP, who made minor alterations; reducing the height and length of the projecting wings and to the interior. The house was then sold to the Roman Catholic Redemptorists who have remained there until a recent review of their activities prompted them to put the house, with its 7-acres of gardens and 81-acres of grounds, up for sale for £5m. Any purchaser looking to make this a home again will need to demolish the ugly accommodation block tucked away behind the left wing and will also have to consider what they wish to do with the large chapel which was added in 1932; perhaps if bought by a non-religious family it would make a superb music room. For a house which exhibits such architectural interest and grandeur, it seems like a fair price and one hopes it will attract someone willing to invest to recreate what could be one of the finest homes in Shropshire. This entry was posted in for sale, News and tagged architecture, convent, country house, estate, for sale, grade-i, hawkstone hall, heritage, houses, listed, monastery, restoration, shropshire, sir matthew wyatt, viscount hill. Bookmark the permalink. whilst overbearing in size, does at least attempt to harmonise with the house (successfully, in my opinion) and is reasonably sympathetic and respectful. Perhaps, when one considers the decade in which the extension was built, it is perhaps lucky that something more nightmarishly offensive and disrespectful was never built, e.g. a wing designed along the lines of the horrendously ugly 1960s Eaton Hall, for instance. Hi Jonathan – thanks for your comment. I suppose we should be grateful for whatever architectural ‘nods’ in the design of the block but I think this is a case, as you say, of being thankful it wasn’t anything worse. However, the best outcome for the house would be return to use as a single-family residence so, barring someone with a frightening number of children, the block would need to be removed. I suspect this is one of the few cases where reducing the number of bedrooms would actually make the house more valuable. Just out of interest, what would your thoughts be on the demolition of the current 20th century extensions (barring the 1930s chapel) and the building of a new, less overbearing wing, more in sympathy with the original house? More importantly, would the powers that be allow it? Considering the likely usable floor space it would seem un-necessary (to my mind) to require a replacement. Also, the house as originally built, had rather lovely proportions and the ungainly wing unbalances it so to remove it would be to restore it to a more pleasing size. I’m usually with the SPAB in that a house should reflect the changes it has undergone, but where the changes are on an institutional scale, such as this, it would be inappropriate to retain either the accommodation building or the proportions if the house reverts, as is hoped, to use as a private home – they should be considered a temporary aberration. To be honest, the chapel is also slightly too large, reflecting the needs of the Redemptorists rather than that of the role of a country house church but as it is a good example it should certainly be retained. It would make a marvellous music room if the new owners didn’t wish to carry on its use as a place of worship. Here is a late 19th century image of Hawkstone Hall before the wings were shortened by 2 windows and the chapel and accommodation block built. I wonder why the wings were shortened by such a small amount, as it hardly seemed worth the effort. If the house becomes a private home again, it would seem likely that an indoor pool would be built, either in place of the accommodation block, or within the Chapel (as was done at Repton Park in Essex). The link to the property details at Barbers has been updated after they inexplicably changed it. Hasn’t improved the quality of the text or editing so not sure why they bothered. Also added a link to the property details provided by the joint selling agents, Reeves & Partners, though this is also sparser than would be expected for a house of this quality. Would love to know why these particular agencies were chosen…! Matt, I can understand why the church appointed Barbers, who are a local estate agent with all its 5 branches being in Shropshire, surrounding the Hawkstone estate. However, I’m also at a loss why Reeves (with only 2 branches, in/near Coventry) was chosen as the second agent, rather than one that could provide national and international coverage, such as Savills in Telford, or Strutt & Parker in Shrewsbury (UK affiliate of Christie’s International Real Estate). Perhaps they are confident that a local buyer is the most likely and preferred option, or there was an existing business relationship with the church.